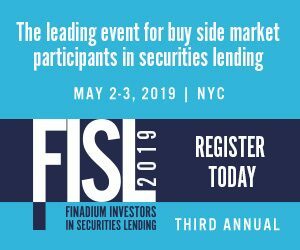 The 3rd annual Finadium Investors in Securities Lending (FISL) conference arrives in New York on May 2-3. The agenda is nearly set, and features a wide range of asset managers, hedge funds, banks and vendors speaking on what matters most to their securities financing activities. Come for the education, stay for the networking, and get back to the office with critical new ideas in revenue generation and operational efficiency. FISL offers education and networking opportunities across different levels of market participants. Panels for the entire audience cover important topics for all participants, including the current state of the industry, developments in technology, and the cash collateral reinvestment environment. This year, FISL will support ten breakout sessions across market segments (mutual funds, pensions, insurance and hedge funds) and thematic topics. Newcomers to securities lending will benefit from two securities lending 101 sessions focusing on best practices in program management. Intermediate market participants will hear from market experts on managing counterparty risk across bilateral and CCP transactions, and on integrating securities lending data into the investment process. Advanced market participants can join conversations on the evolution of the Agent Lender business model and merging securities lending into collateral optimization activities. As securities lending receives greater attention from regulators and in the press, FISL is an excellent opportunity to keep up to speed on the market and support detailed conversations with investors, boards and internal teams. We recognize that time is limited for busy buy side professionals. In this day and a half conference, we deliver concise, up to speed content on what is happening in securities lending and why you and your clients will care. FISL is a free conference for the buy side. We do not sell tickets to the general public to maximize opportunities for by buy side to buy side networking. There are now 110 buy-side representatives signed up to attend across 70 institutions. See the full attendee list here. The event is sponsored by the market’s leading bank and vendor service providers. They attend not just to meet clients but also to hear for themselves what their clients are saying. As Paul Calderone, COO of Hazeltree, noted, “We are excited to be a part of Finadium FISL conference and to have the opportunity to discuss with leading buy-side firms how they are embracing technology to drive significant business growth”. This spirit of interaction is a common sentiment across our sponsors. As our keynote speaker this year, we are pleased to welcome Guy Haselmann. Guy has a long career on both the buy-side and sell-side as a macro strategist. He will be speaking on “Hubris: a macro view of today’s investment paradigm”. This is an especially relevant topic in an age of geopolitical transitions, from Brexit to unconventional monetary policy to politics. We work hard to make sure that FISL is not your average buy-side conference. Every year we consider the most important new topics in securities lending and arrange panels, with expert panelists, to deliver their views. If your buy-side firm participates in securities lending or is thinking about getting involved, then FISL is the place to be.